Many families deal with the challenges of an injury, illness or limited mobility due to age related issues. A family member may need a wheelchair to get around, both inside the home and outdoors. For a wheelchair user, their previously adequate living spaces can unintentionally become yet another obstacle to overcome. The bathroom can be a challenging space for a wheelchair. Getting in and out of the wheelchair itself, slippery flooring, and narrow doorways greatly increase the risk of falling and getting injured. Instead of struggling to perform simple tasks, wheelchair users will find it more useful if their bathroom has been upgraded to be wheelchair friendly to make these activities easier and safer. 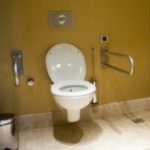 While renovations may not be a viable option for all, there are also a wide variety of bathroom safety products that can be installed in the bathroom for a wheelchair user. Accessible bathrooms are one of the cornerstones of independent living for a wheelchair user. It is important to work with an Occupational therapist to understand the best way to make your bathroom safer to care for the functional and future needs of your family. Bathroom Location: The ideal place to have a wheelchair accessible bathroom is the ground floor as the users will have difficulty going up the stairs. Wide Doorway: Getting into a bathroom can itself be a challenge for a wheelchair user. Doors should be wide enough for wheelchairs to pass through with no difficulty. Some bathrooms have an open and straight entryway, while for others the wheelchair needs to be turned to enter the room. Straight doorways have to be at least 80 cm wide, whereas, if the wheelchair has to turn a doorway of minimum 90 cm is necessary to provide enough clearance. Threshold: Ideally there should not be a threshold at the entrance to the bathroom and side the bathroom. If the threshold is more than ½ inch in height consider removing the threshold as they are not conducive to rolling over with a wheelchair. If they cannot be avoided, consider having the threshold bevelled (to a slope) or add a threshold ramp if it is shorter. Flooring: Flooring should be slip resistant with ample open space to allow a person in a wheelchair the ability to turn around with wheelchair in order to close the door and to use the bathroom facilities with ease. Remove any carpet or rugs that can get tangled in the wheels. Make sure that the floors are always de-cluttered. Remember, bold patterns and shiny floor and wall surfaces produce reflection and glare which can be confusing to those with dementia or visual impairments. Bathroom Sinks: The sink should be at an appropriate level with an open space below the sink so that the user’s knees can slide underneath to easily reach the faucets and controls. Ideally, the sink should be mounted to the wall with no cabinet underneath. Make sure any pipes are properly covered with insulation to prevent contact and avoiding burns due to hot water pipes. An ideal height for a wheelchair user is between 76 cm to 86 cm. Faucets: Single handle faucets make taps easy to turn on and adjust for water temperature without having to grab and twist. Faucets with a sensor that can detect hand movements are a nice addition. Cabinets and vanity: A sturdy vanity at an appropriate height makes it easy for a person to reach the needed items. Consider proper placement of everyday products such as dental care, glasses, contact lenses, prescription medication or first aid supplies. Other items for easy access and storage include hair dryers, shavers and bath cleaning supplies. Pull-out or toe-kick opening shelves enable people to easily open and reach the contents inside. Mounting a low placed mirror or a long tilt mirror is helpful for a person in a wheelchair. Lowered electrical outlets should be installed with easy access for small appliances such as electric razors, electric toothbrushes and hair dryers. Toilet seats: A high toilet seat makes it easier for a wheelchair user to transfer from a wheelchair. The recommended height is 43 cm to 48 cm. When replacing a toilet seat is not an option, adapt the existing seat by installing a raised toilet seat which is added on top of a regular commode. Installing a pedestal or having toilet step stools are other options to get the toilet seat to an appropriate height for the user. Installing grab bars on the wall by the toilet can provide support during the transitions. The flush handle, toilet sprays should be located on the most accessible side of the unit to avoid the person needing to twist and turn to reach the spray. Consider the placement of products that a user may need and have them accessible – such as toilet paper, sanitary products and other medical equipment. 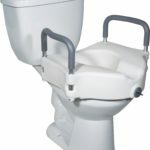 For those who find it difficult to transfer to a regular toilet seat, there are options to use a separate commode chair with a removable bucket. Some can even be wheeled over the regular toilet seat for use. Grab bars: Grab bars are among the most fundamental bathroom safety products as they provide additional stability by giving something to grab or lean on. Installing at least one grab bar to the side of a toilet is recommended, however, two support bars on either side of the toilet is ideal. At least two grab bars should be positioned in the shower area according to the needs of the wheelchair user in the standing and seated position. They should have a non-slip surface with a contrasting colour to the walls. Lighting: Ample lighting in the bathroom is important for everyone’s safety. Light switches should be lowered for a wheelchair user to access them easily. Choose switches that are comfortable to use. They should be in the form of a push button or with large toggles so that the user is able to effortlessly turn the lights off or on. Avoid switches that require a pinching motion. Dimmers and motion detector lights are helpful. Roll-in Showers: They allow the user to roll into the shower area without the need to step over the threshold of a tub. It makes it easier for those with mobility issues to get into and back out of a shower with little to no assistance from a caregiver or additional adaptive equipment. This option does require that shower chairs or benches are water proof or at least water resistant. New walk-in tubs come with air jet or hydrotherapy jets that provide pain relief, rehabilitation and blood circulation. Keep in mind that this will not be helpful for those who need a soaking bath. A hand held shower enables the user to wash and rinse oneself while in a seated position. Shower Seats: Standing in the shower can be difficult and dangerous for those with mobility issues. Specialized bath chairs or benches turn existing bathtubs into a seated shower area and eliminates the need to step over the bathtub wall. 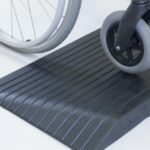 They are one of the first bathroom safety products that should be invested in by a wheelchair user so that they can be seated during their shower. Shower seats come in a wide variety and can even be fitted onto the wall and folded away when not in use. 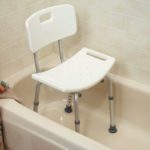 For those who need to soak in a hot bath, there are bath lifts, which is a specialized seat that assists a user to be lowered to the bottom of the bath tub and raised back up again when they finish.